It all started with a Facebook message from a Moroccan guy. Such an exotic character, tall, a face full of stubble and eyes so captivating – who could resist such charm coupled with charisma fitting of the face? I was wary, but photos of his travels to Asia got me interested. He knew so much about the Asian region. I figured it would only be fair to him if I started reading up on Northern Africa. A month later, I decided to travel Europe alone, but I knew I had to fit Morocco into the itinerary. 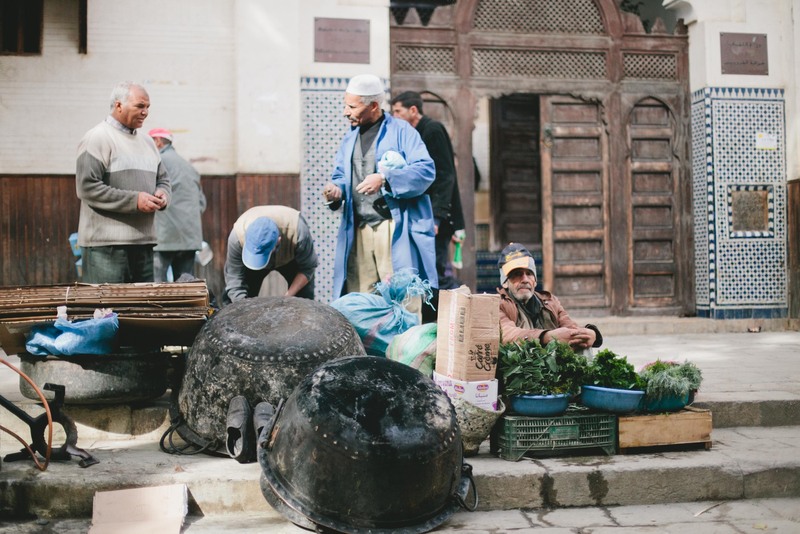 Every travel forum and discussion group I read sang high praises for Morocco – the beautiful sand and sea, the mysterious deserts, the bustling souqs and the famed Atlas Mountains. The appeal of what Morocco had to offer surpassed the appeal of the young gentleman who intrigued me in the first place. The next thing I knew, I was on a flight out to Casablanca. A whole entourage of close family and friends had sent me off, knowing that I would be gone for a month. My family and friends were used to me traveling, but this was the first time I would be away for such a long time, and on top of that, traveling solo. While my mother worried about me bring home a boy, my best friend worried about me not coming home at all. After all, I had just left my job. With no commitments back home, I could have easily gone on a traveling spree for a few months but I chose to focus on the traveling, and see if I liked the life of a nomad. About sixteen hours later, with a two-hour layover in Doha, I arrived in Casablanca, the economic capital of Morocco. I was greeted with cold winds and sprinkles of rain in my face. My seven am flight battled through an early Sunday morning rain. No wonder I could not see much of the country while looking out the window. As I stepped a foot on to the gravel of the airport, I took a deep breath and registered the smell of Morocco. A gust of wind sent chills through my spine. I took out my coat from my backpack. I was ready for my adventure to begin. Morocco’s lingua franca is Arabic despite being situated in between two major continents – Africa and Europe. 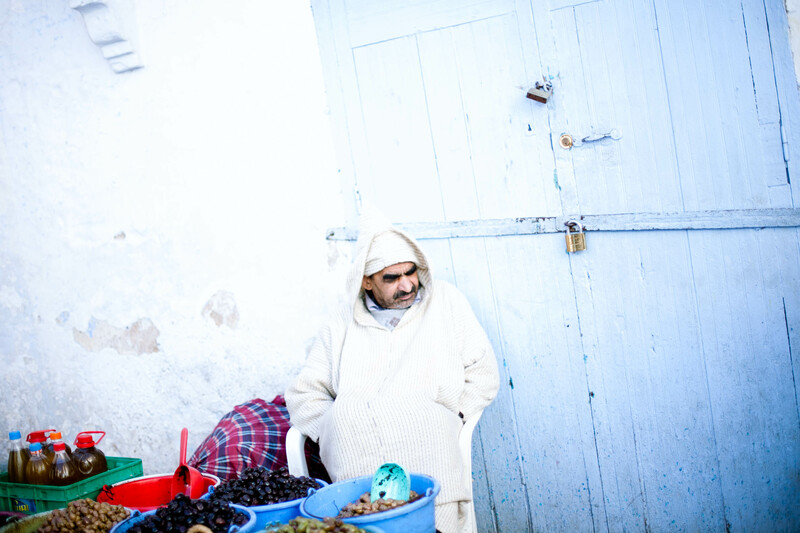 The local dialect of Arabic, however, was infused with French and it made learning Moroccan Arabic even more difficult than the standard Arabic. Apparently, one semester’s worth of studying basic Arabic did not prepare me enough for Morocco. Thankfully, a local middle aged man saw me having difficulty communicating with the train ticket counter staff and came to my rescue. 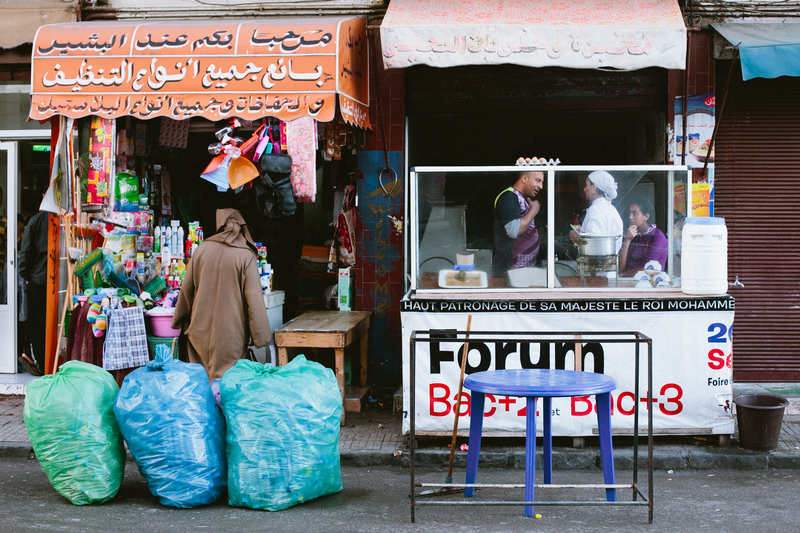 A typical mini mart in the heart of Casablanca. Upon reaching Casa Voyageur, the main train station in Casablanca, my dear friend Jannah greeted me with open arms. 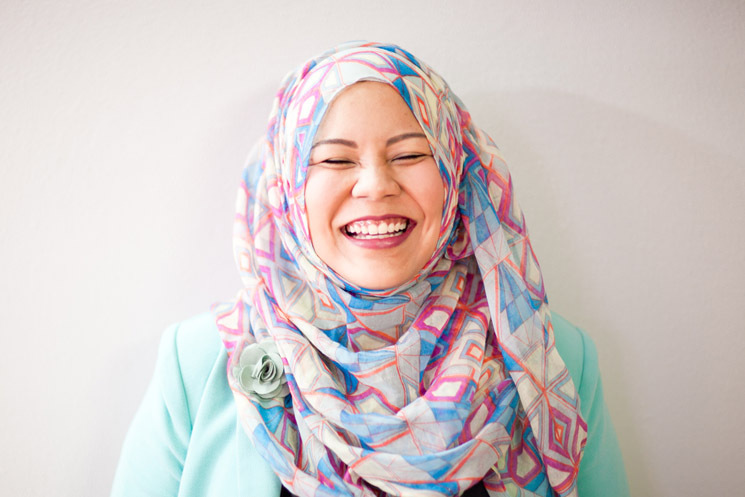 Jannah is an SMU undergraduate who was on exchange in Casablanca. I was blessed with friends who were scattered all over Europe at the time of my travels. Who could resist free accommodation and a glimpse of life as a local while traveling? Ahmed became my train companion to the city. 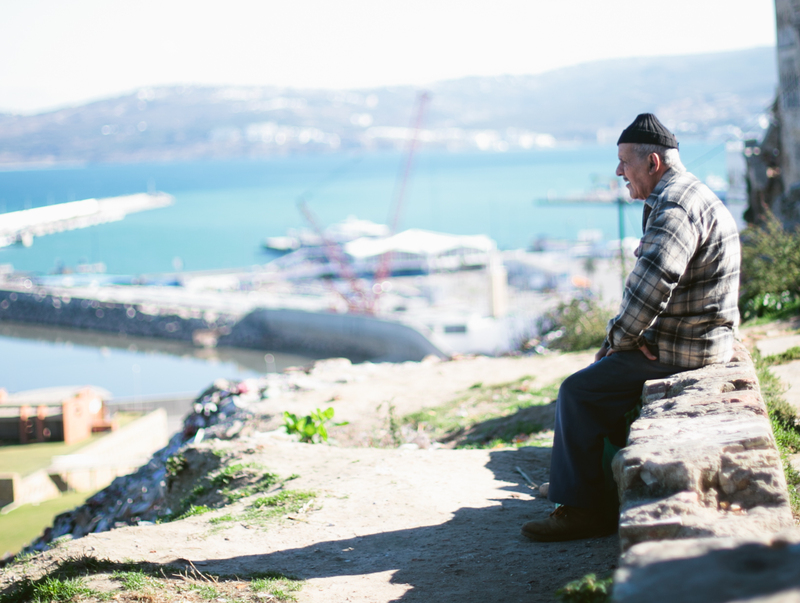 He was visiting his mother in his home city of Tetouan. Having spent the last twenty years of his life in Netherlands, Ahmed had plenty of stories to share with me during our brief encounter. He warned me of sly young Moroccan men (of which I already took precaution of since making friends with the earlier-mentioned Moroccan guy), boasted about Moroccans’ ability to speak multiple languages and reminded me to visit his home city. I walked past an ongoing street protest about the government raising the prices of fruits and vegetables. The first thing I looked forward to in Morocco was the street food. 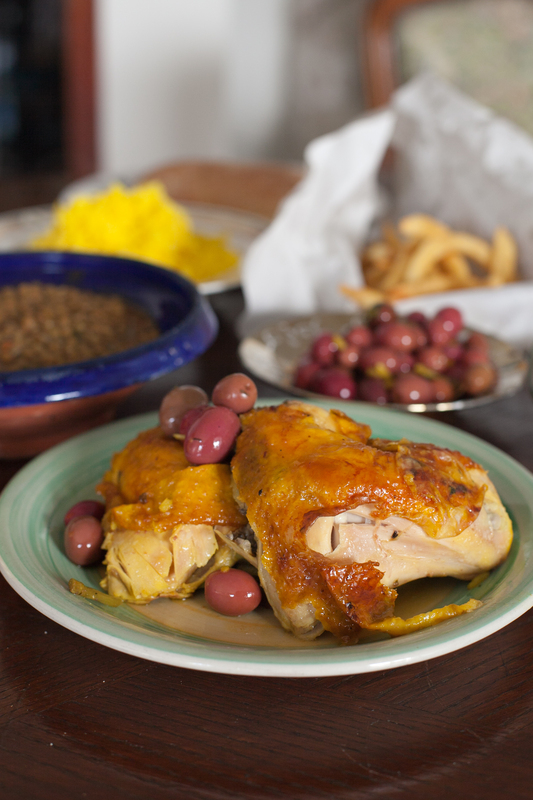 Years of dining at the so-called Arabic and Moroccan restaurants of Bussorah Street only brought shame to real Moroccan food. The tagines and infusion of sweet and savory in authentic Moroccan cuisine were divine. The flavor of spices like cumin, paprika and cinnamon would burst in your mouth as you bite into juicy chunks of meat and tomatoes. Bread and olives come together with your tagine as a set, and a Moroccan meal is never complete without a glass of fresh Moroccan mint tea. Posing for the camera on Ain Diab beach. My first meal of chicken tagine upon touchdown in Casablanca, lovingly bought by Jannah. Jannah took me on a tour of the city on foot. Casablanca was bustling with life, more specifically, nightlife. The streets of Ain Diab saw a plethora of pubs and clubs. In a country where Islam is evidently imprinted in culture and tradition, Casablanca is refreshingly modern and westernized. The malls carry European and American brands, and surprisingly, homegrown brands Charles & Keith and Pedro too. Hassan II Mosque of Casablanca, Morocco. On the contrary, the Hassan II Mosque provided respite from the chaos of the city. The minaret stands at 210 metres tall and it has a capacity of 105 000 pax – I heard that during the month of Ramadhan, up to 500 000 people flood the mosque grounds to carry out the nightly terawih prayers. 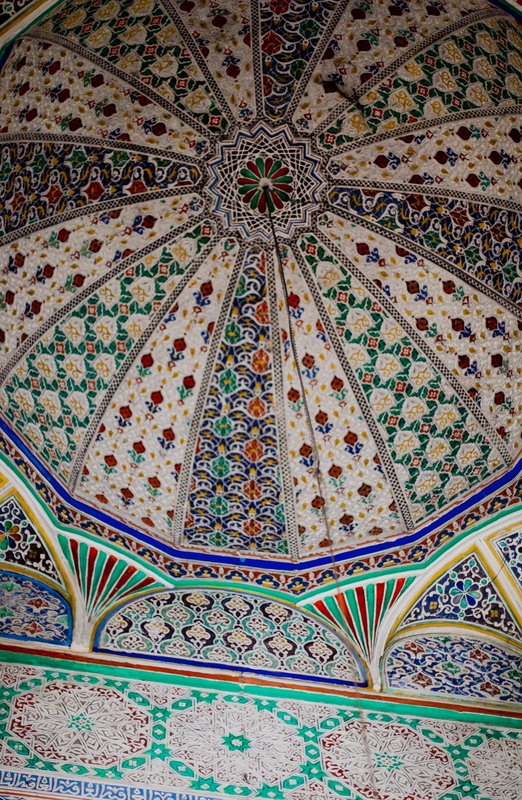 I took the opportunity to step inside the praying area and marvel at the intricate architecture. It became clear to me why it took 7 years and more than $500 million to build. A middle-aged man walks around the Hassan II Mosque, waiting for the call for prayer. 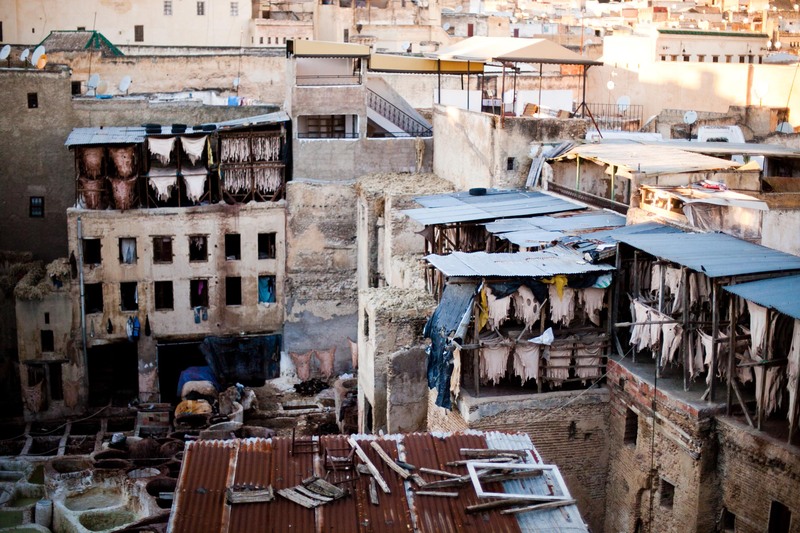 The famous leather tannery in Fez, Morocco. They still use ancient methods of making leather by hand. A little boy in one of the shops selling leather goods. 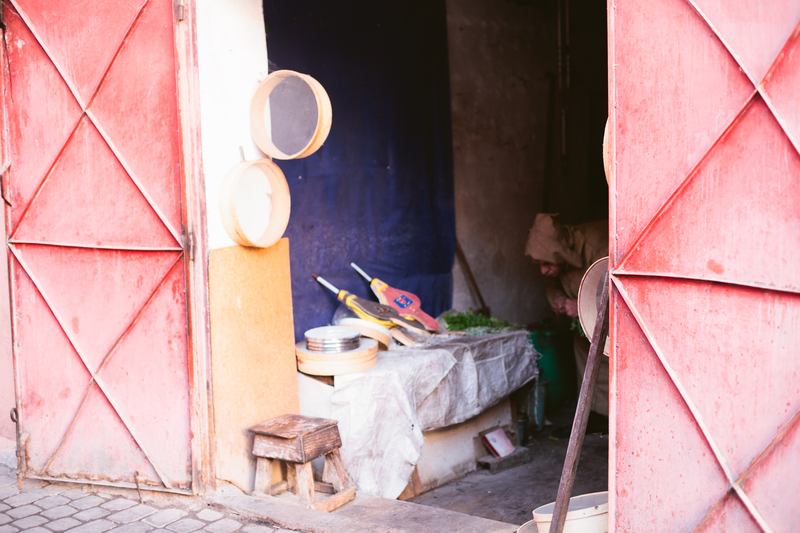 After spending the first two days of my solo adventure in Casablanca, I took a four-hour train ride to Fez, the city most well known for its leather tannery. I stayed in a cozy little hostel near the old medina and made a few friends. I even met a fellow Singaporean who shares the same name as me (a guy version, however) and has been traveling for two months! It was exciting for the both of us because we took the chance to converse in colloquial Malay. I ventured Fez on my own on the first day, keeping in mind to stay safe and come back to the hostel alive. A makeshift stall on the streets of Fez. My first meal in Fez was a huge camel meat kofta kebab. The tenderness of the meatballs was cleverly mixed with a plethora of spices, among which were cumin and paprika. Topped with a dollop of yoghurt mint sauce and filled with garden vegetables, the kebab pretty much filled me up for the rest of the day. I headed back to the hostel to wash up and rest. I was desperate for some sleep. After a good night’s rest, I filled my stomach as much as I could with the free hostel breakfast. It wasn’t much, but being a traveler on a budget I had to make do. I had earlier planned to go on the free walking tour, but somehow the tour was cancelled. I made friends with a fellow solo traveler, Ariel from Argentina, who arrived in Fez about the same time as me. Standing at about 1.9 metres tall, I would have easily fallen in love at first sight with him if I were back home. Since I was traveling, I couldn’t care less. Two young ladies at the entrance of the Fez library. Visitors were not allowed in. We explored the entire old medina of Fez, walking on the outskirts of the medina to see the castle ruins and take a breather at the top of the hill. The view of Fez from the castle ruins was simply breathtaking. For the whole hour we were there, I could not stop marveling at the beauty of the country. The clear blue skies, the beautifully aging bricks walls and the old people who were never short of compliments; Fez was charming. One of the main reasons I love Morocco – the beautiful Islamic art displayed in the mosques. I spent my last night in Fez in the comforts of the hostel, smoking shisha with Ariel, and making small talk with others who were sitting around us. As much as I would have loved to be part of the party at the hostel rooftop, I was gathering all my excitement for the next city I would depart for the morning after. Just a three-hour bus ride away from Fez is Chefchaouen, the blue city. Situated in northwest of Morocco, Chefchaouen sits amongst the Rif Mountains, and is just inland from Tangiers and Tetouan. 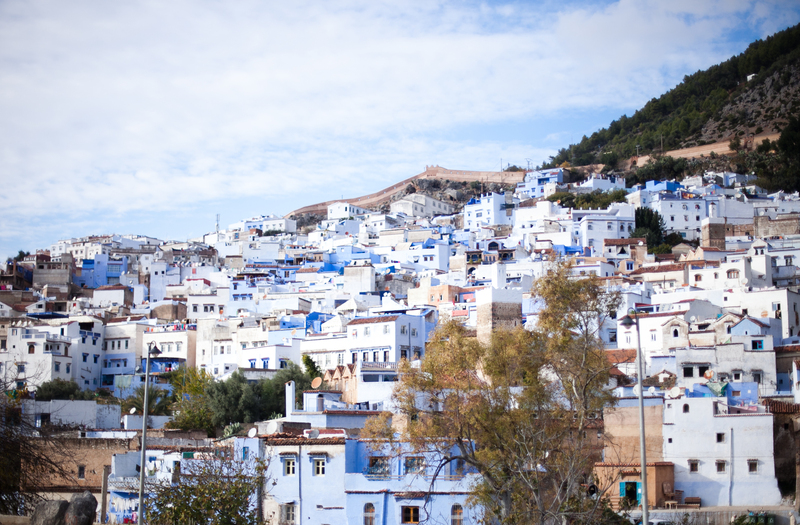 Chefchaouen was formerly part of the Spanish Morocco but was returned to Morocco in 1956; hence Spanish is a more common language in this city. I fell in love with Chefchaouen at first sight. I stumbled upon images of the city on Tumblr and was delighted when I found out the blue ville is actually in Morocco. It felt like I was living in a snow globe of sorts. The chilly winter with a hint of the sun was perfect to me. Pastry and boulangerie shops lined the quiet streets, while the main souq was filled with old men and women making a living out of selling fruits, vegetables and knick-knacks for the curious traveler. A man settle fruits and vegetables just outside of the souq. I reunited with Jannah in Chefchaouen. The main mosque in Chefchaouen stood amidst restaurants and coffee shops. Since it was a Friday when we spent our second day, we sat down in one of the restaurants and watched the men head to the mosque for their Friday prayers. It was a remarkable sight. Compared to Singapore where only about fourteen percent of the population is Muslim, Morocco’s official religion being Sunni Islam means their lifestyle and culture are deeply embedded with the religion. The beautiful view of Chefchaouen, also known as the Bleuville. We spent our two days in Chefchaouen eating, hiking, relaxing, eating, talking – did I mention eating? Despite the lack of activities for tourists, the quaint city still attracts people from everywhere just because of its beauty. Indeed, Chefchaouen placed me in the shoes of the most superficial men I have encountered. We took a bus to Tangiers after two days in Chefchaouen. Jannah was due to meet a fellow Singaporean, Aida, who married a Moroccan and relocated to Tangiers. My plan was to bid farewell to Jannah in Tangiers so I could catch a sleeper train to Marrakesh. It was the weekend of the Marrakesh International Film Festival and I wanted to be part of the action. After hearing so much about Aida, I ended up spending the weekend in Tangiers. Our hosts were welcoming and they made us feel at home. Newly-weds, Aida and Karim were excited to have us over at their place, as we were their first guests. Tangiers was like another Casablanca to me, except that Tangiers offered more than just malls and a mosque. Hercules Cave, where the supposed son of Zeus separated Spain and Morocco, is one of the more popular tourist attractions. The sea provided a clear view of the Straits of Gibraltar, which must be accompanied with a tagine of fresh fish and vegetables. 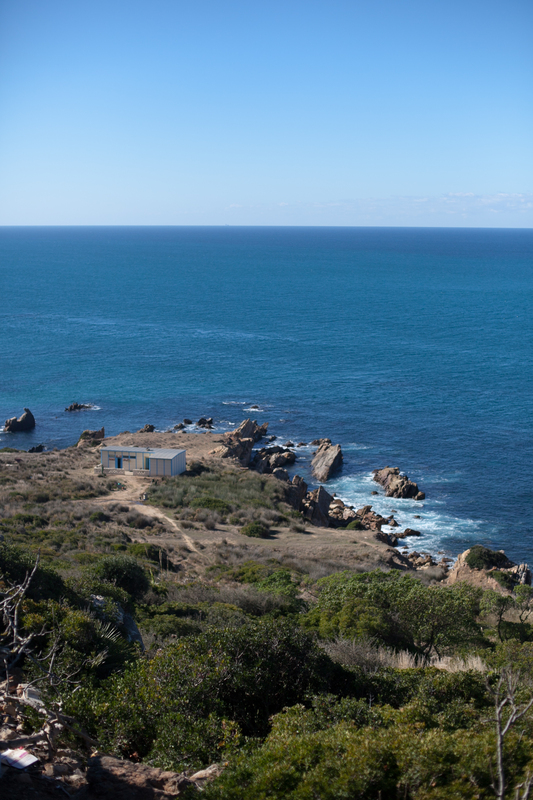 The winds and sounds of the sea would remind you of the beach, and for a while, you forget that you are in Morocco. An old man contemplating on life. He was playing football with his friends. Right after this shot was taken, he looked at me said, “1 Dirham!” I ran away after that. Jannah (in the pink hijab), Aida and her husband Karim with some men we made friends with. On the way to Grotte D’Hercule. Endless horizon at Grotte D’Hercule. I ended my nine-day tour of Morocco by spending the last day in Marrakesh. After a fourteen hour train ride from Tangiers, I was tired and famished. I did not prepare myself well for the commute, and was dying for a place to rest. Thankfully, the hostel, which I cancelled my reservation at, welcomed me with open arms although I was not checking in for the night. I was served tea by the front desk personnel, Muhammad, and was even given free breakfast. The hospitality of Moroccans never failed to amaze me. After walking around the famed Jemaa Al-Fana for half a day, my feet were begging me to rest. I finished my souvenir shopping and made my way back to the hostel – a very long way back because I got lost in the maze of the medina. After a two hour unintended detour, I arrived at the hostel and rested for the remaining hours before catching my flight to Sevilla. On the way to the airport on a motorcycle taxi, I soaked in my last Moroccan sunset. The orange hues in the sea of blue sent chills to my spine, and somehow, it brought tears to my eyes. I had to bid farewell to Morocco. I was not ready to leave Morocco. I had yet to experience the Sahara Desert, skiing in Ifrane, or climb the Atlas Mountaints – but I know deep in my heart I would be back someday, somehow, to this marvelous land called Morocco. I left pieces of my heart in the cities I visited. A little in Casablanca and Fez, a piece in Chefchaouen, and a little bit more in Tangiers and Marrakesh. As much as I wanted to drop the rest of my Euro trip and stay in Morocco, I decided not to. I soaked up the last air of Morocco I could while I was at the Marrakesh airport, and told myself I will be back – and hopefully the next time I am in Morocco, I have a lifelong travel partner by my side. Nightly prayers only held during the month of Ramadhan. These prayers are not compulsory for Muslims, but highly beneficial.